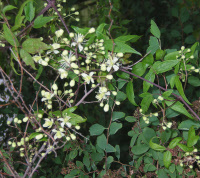 July-September star-like white blossoms cover this vine – good for clambering up small trees. Care: Sun to shade moist well-drained soil. Flowers on new stems so cut back in late winter or early spring to 6-8” above the ground. 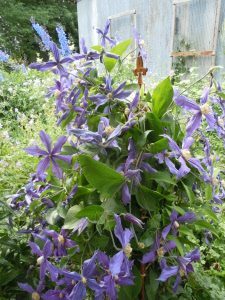 The genus Clematis was named by Dioscordes, physician in Nero’s army, from “klema” meaning climbing plant. One of 1st No. American plants sent to Europe – grew in Tradescant the Elder’s South Lambeth nursery in 1634. Grown by Jefferson at Monticello in 1807. Described by Breck in his 1851 book The Flower Garden: “The flowers are white borne upon cymes, and make a handsome appearance.” Cherokee mixed this plant with milkweed to remedy backaches. A root extract cured stomach aches, nervous conditions and kidney ailments. For the Iroquois powdered root fixed venereal disease sores and an extract of the stem brought on strange dreams. Pressed specimen in Emily Dickinson’s herbarium. Pendulous lavender trumpets with bodacious flares bloom profusely, blooming machine all summer into fall. Care: sun to shade in moist well-drained soil. Prune back to 1’ above ground in early spring. Awards: Elisabeth Carey Miller Botanic Garden Great Plant Pick; Cary Award Distinctive Plants for New England; and England’s Royal Horticultural Society Award of Garden Merit. Selection of a cross between Clematis crispa and C. viticella, made in 1932 by Betty Corning. Big, deep indigo saucers – all summer into fall. 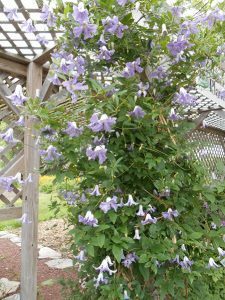 The best short Clematis. Care: Full sun in moist well-drained to well-drained soil Prune back to a few inches above the ground in April. Needs staking or let it sprawl. Awards: Elisabeth Carey Miller Botanical Garden Great Plant Pick. Vigorous 20′ tall climber bearing papery cones, green turning straw colored from August to October. Transported from continental Europe to England in 1524. Flowers used for brewing since ancient times. Added to ale to add flavor and as a preservative. 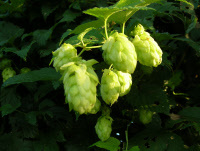 In the late 1500’s Gerard claimed that hops seasoned ale and”make it a physical drinke to keep the body in health, rather than an ordinary drinke for the quenching of our thirst.” Russians crowned the heads of brides with its foliage to bring “joy, abundance and intoxication.” Others put dried hops into pillows to relieve insomnia. Imported to America by the mid 1600’s where it was used for its ornamental qualities, to provide shade and to make beer. Cherokee adopted hops to relieve pain caused by rheumatism. Grown by Jefferson at Monticello.